If you're a snacker like myself then you'll definitely want to be check out snacks from Pure Organic. I'm on my quest to eat better so I'm slowly removing things from my diet that aren't really good for me. That means all those bags of chips and candy bars too! Thankfully I've found a few snacks lately that have really appealed to my sense of taste and are actually good for me too. One of those is Pure Organic fruit sandwiches, I don't know exactly how to explain them, but man are they good! It's like eating a healthy version of a fruit roll up all stacked up without all of the added sugar! Plus it actually tastes like fruit too, which if you ask me was something roll-ups didn't have going for them. I like the sandwiches because I can toss a couple of them in my purse to enjoy while I'm waiting at a doctor's appointment, or really anywhere else I have a few extra minutes and need a quick pick-me-up. Another snack I'm really liking are the Pure Organic fruit and nut bars. To be honest I would rather eat one of them than a candy bar now. I just don't find myself with that candy bar craving I used to have. They each have their own unique flavor blend so I can switch it up anytime I like if I get tired of one flavor. But lets be honest who could get tired of peanut butter and chocolate chips? 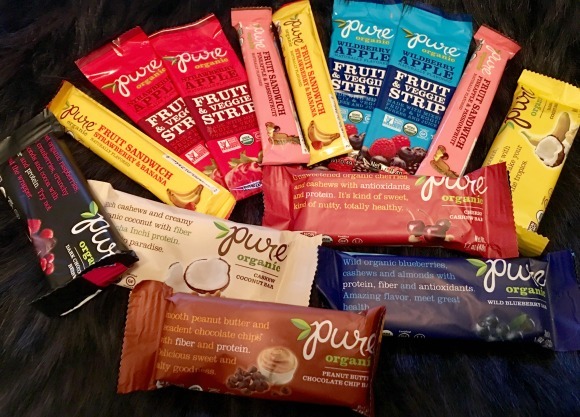 Pure Fruit & Veggie Strips are chewy sweet treats that are certified organic, non GMO, vegan, gluten free, soy free, kosher and made with fruit and vegetable juices and purees. We use no cane sugar or syrup, and no artificial flavors or colors in our nut free snacks, which are produced in a peanut-free facility. You’ll love having these healthy snacks on hand when you’re on the go. Pure Fruit Sandwiches are certified organic, non GMO, vegan, gluten-free, soy free, kosher and made with fruit and vegetable juices and purees. We use no cane syrups or cane sugar, no artificial flavors or colors, and our fruit snacks are produced in a peanut-free facility. Our nut free dual-layered organic fruit snacks blend complementary flavors like pineapple with passionfruit and strawberry & banana for a natural treat. Oh these look so good! This year I am trying to switch over to healthier products, I have to try these!